When Aromatique first engaged with NetSphere Strategies, the company was moving to the latest version of WebSphere Commerce with the goal of improving the customer experience. Along the way, Aromatique received prompt and skillful service from NetSphere Strategies, just like the type that was eventually afforded to its own customers. 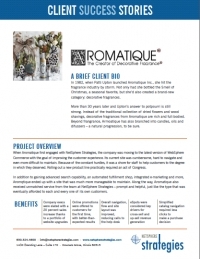 To learn more about the benefits Aromatique received by working with NetSphere Strategies, download the client success story below. As a prosperous company in the competitive footwear industry, Allen Edmonds was constantly striving to enhance its digital presence. To learn how NetSphere Strategies helped the company achieve those goals, download the case study below. 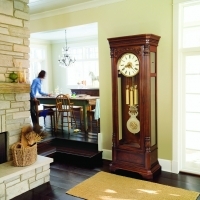 Howard Miller found itself needing a B2B eCommerce site for its clients to make product purchases online. The challenge was that the company needed to reduce the in-house learning curve, keeping staff involved from the start. A partner who could transfer as much knowledge as their capability allowed was a must. That included on-site mentorship, remote 24X7 support plus phone and e-mail collaboration. Brick by brick, the village of Bolingbrook near Chicago is building an IT infrastructure that is reducing bureaucracy and improving “customer” satisfaction among citizenry. Paving the way is IBM Business Partner NetSphere Strategies, the architect of an IBM Express-based solution enabling the government to deliver online business services.